The Chloramines Monster is designed to be installed on your RO system and treat the chloramines in environments where large volumes of water need to be produced. At common RO system, incoming flow rates (less than 1g/min) the manufacturer has informed us the Pentek CRFC20-BB cartridge will last 75,000 gallons. At a 3:1 waste to product water ratio this filter will produce almost 19,000 gallons of RO water. Chloramine is different than Chlorine and is used in 10% of U.S. water supplies. 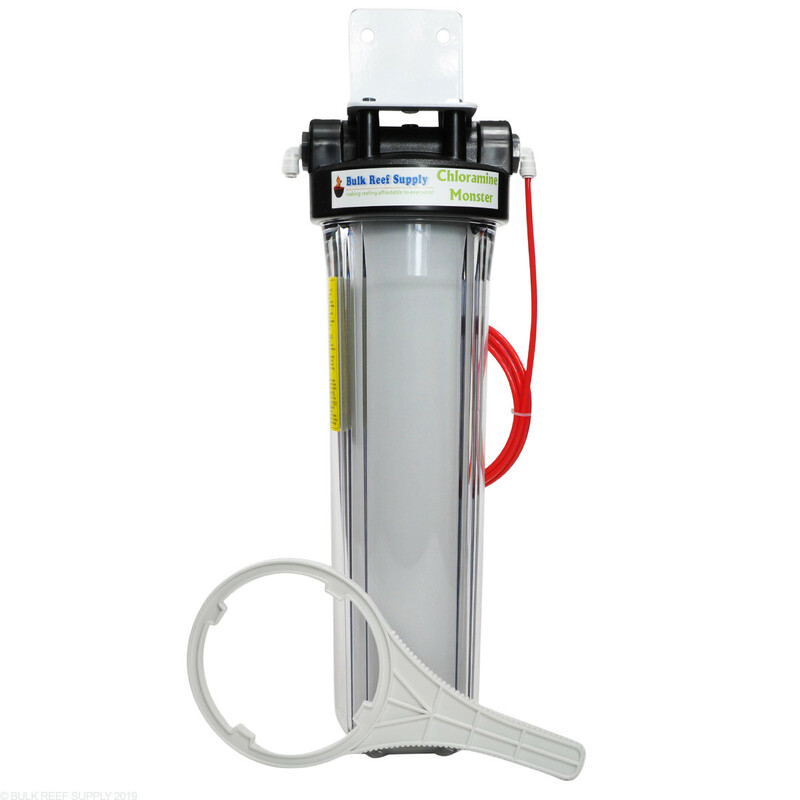 Standard RO filters will not remove chloramines from the water. If your household water supply contains chloramines install the Chloramine Monster before your current RO system. If you are unsure if your city uses chloramines, call your water treatment center or city hall and ask. They should also be able to provide you with a water quality report as well. 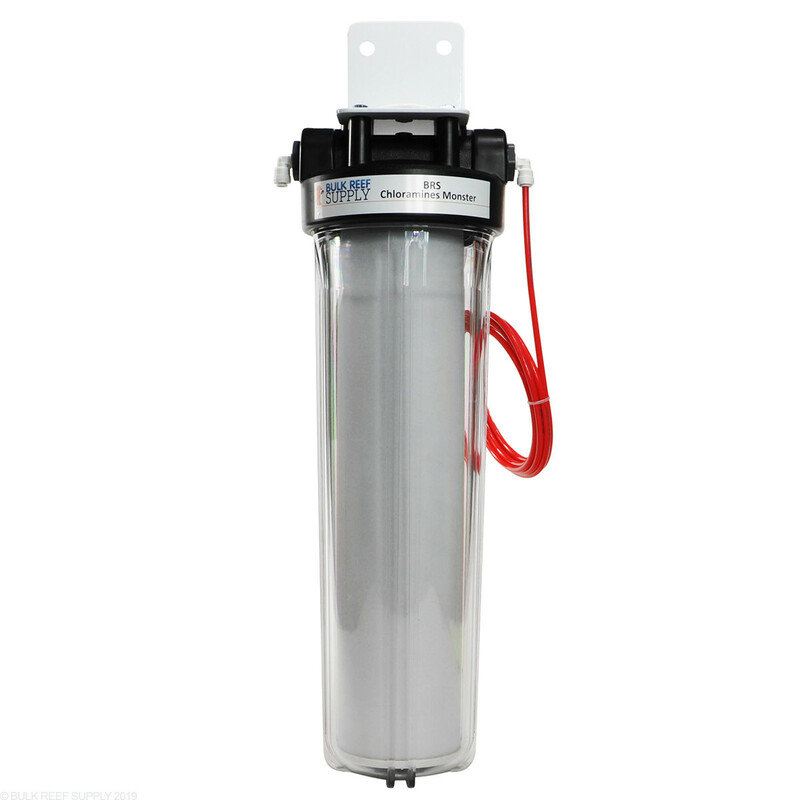 Each BRS Reverse Osmosis Chloramines Monster contains a Pentek CRFC20-BB Radial Flow Carbon Filter and is ideal for chloramine taste & odor reduction in POE (Point-of-Entry) and other high-flow rate applications. 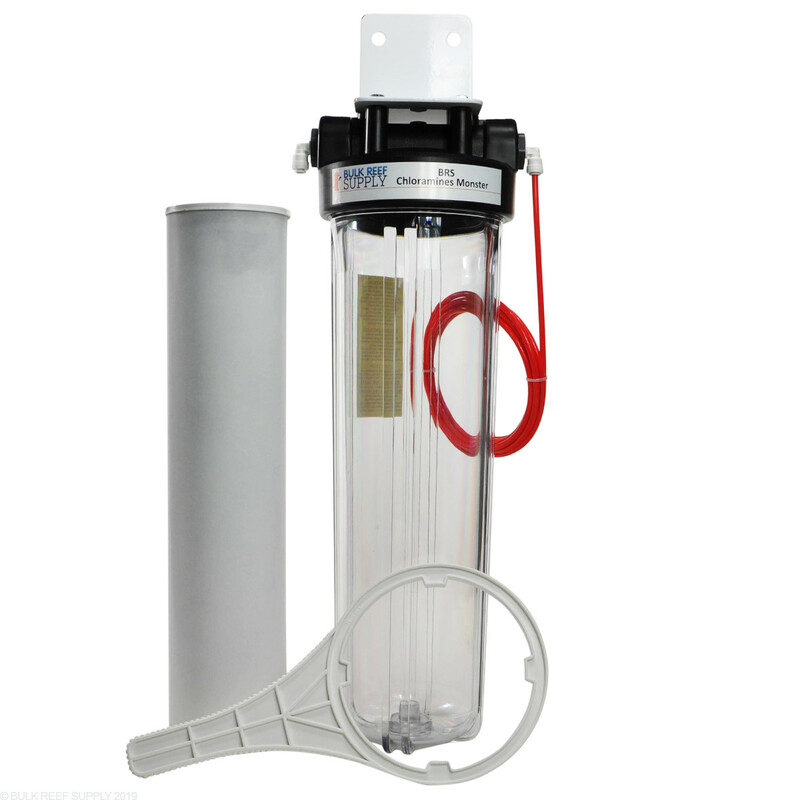 The CRFC20-BB reduces chlorine, chloramines, taste & odor, and particulates from your water. A radial flow design that offers low pressure drop, minimal carbon fine release, and extended cartridge life. The huge radial cartridge of surface modified carbon provides the extended contact time that is required to properly convert chloramines into harmless chloride and nitrogen. 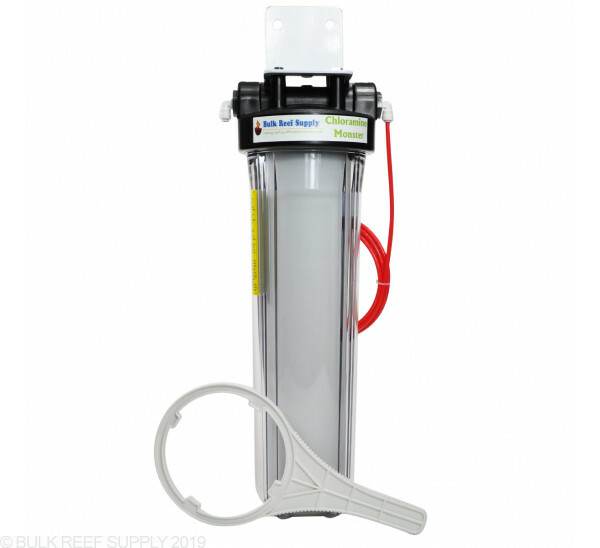 At common RO system incoming flow rates (less than 1g/min) the manufacturer has informed us the Pentek CRFC20-BB cartridge will last 75,000 gallons. At a 3:1 waste to product water ratio this filter will produce almost 19,000 gallons of RO water. We recommend this unit be used in conjunction with the Pentek ChlorPlus carbon blocks in your RO system. I finally had enough of replacing Membranes due to Chloramines exhausting the 10" Carbon/Chloraplus/Choramine Filters. The last straw was using 3 x 10" Chloraplus Filters and having a 99% membrane go to a 20% membrane in 6 months.When BRS ran there Black Friday sale I jumped on it. This was the solution to my reef never looking good more than 8-10 weeks at a time. If you have chloramine in your tap, you MUST have THIS product. It took 5 years for me to realize even double chloromine and chlorine removal cartridges/carbon blocks were wearing out after a few weeks. I was dosing chloramine in my tank all the time with my top off water, with no idea. Now I have this after a full water change. It's been 3 months and my tank is doing amazing. Can keep acros and SPS I never could before. So if you're doing everything right, and you cant figure out why your tank will never get off the ground, see if your tap water has chloramine. My tap is 3-6 ppm total chlorine -- all chloramine. Well, I was very excited to get this filter. It is a beast!.. I got home and installed it only to find the left 1" fitting leaks badly... After I fixed that one, I found out the canister wasn't tightened well and that leaked as well... And then when I fixed that, the right 1" fitting had a minor leak, so I had to fix that too. No biggie but it created a mess in my garage. This thing is Monster in size. I call it a chloramine buster... lol... BRS has great support there was a small issue on arrival that the fixed within 5 mins on the phone. Will for sure keep coming back! I am on LADWP and my club made it known to me that I had to treat for chloramines... excellent buy you won't be disappointed. So far we have mainly used it for drinking water, but the removal of all chlorine taste is great. We especially love its capacity as our city likes to turn up the chloramines during the summer. They aren't kidding about it being a monster, it's a BEAST. My town water uses a lot of chloramine, so I got this for the extra assurance that nothing would get to my livestock. I gave it all fours as it was expensive and I haven't really tested the output for chloramine levels. But, just based upon the sheer size of it, it definitely gives me piece of mind that nothing is getting through. 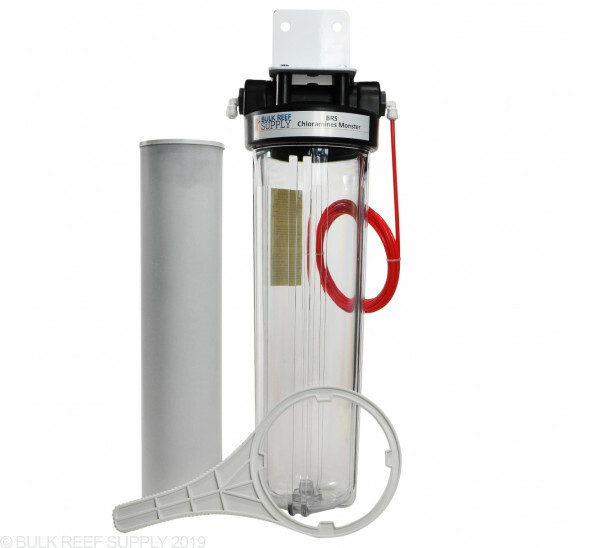 There is not a solid pre filter other than more sediment filters. 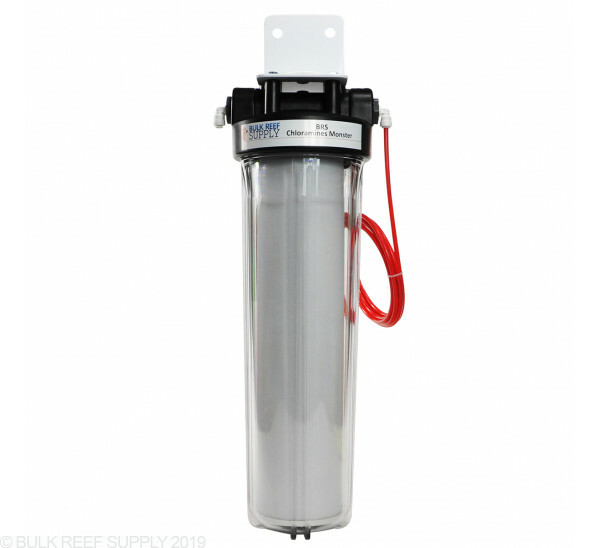 You can add an additional canister to the front of your unit and place in another sediment filter. Feel free to let us know if you have any further questions! It looks tall. How big is it exactly? If I have upwards of 3-5 ppm of total chlorine (in form mainly of chloramines), then I can use only this monster cart and no other carbon carts is how I understand it. Right? So I would have the sediment basic block (no carbon in it) then the monster, then the RO then the DI. Just making sure. As I would love to get this and not worry for several years! it's a large upfront cost but I think it would pay for itself in like 2 years with as much chloramines I have. Thanks! I have your stage 4 rodi value system does that get rid of chloramine from water or do I need a filter for that also. But you don't sell any small chloramine single add on systems, or can I buy canister and filter for it and add to it. If so what would I need to get? The easiest way to convert a standard 4 stage RODI system to one capable of removing chloramines would be to purchase an additional chamber along with the Chloramine conversion kit. The added chamber will hold the sediment prefilter and you can then install the carbon stages in the next 2 chambers while leaving the DI in the last chamber. or purchase the individual parts to avoid having to buy an extra DI canister. What are the fitting/tubing size in and out of this unit? These will come with 1/4" connections. Feel free to let us know if you have any further questions! Do you sell just the plastic canister? Somehow mine cracked (hairline) and I used jb weld 16 but it’s still leaking a little and a bit of water is dripping from the top. I just replaced the filter cartridge which was pricy and the canister cracked within a week of the new cartridge so I don’t want to have it buy an entire new system. Any options? Thanks! We do offer replacement canisters that come with a new head and canister. You can either search our site for SKU 200901 or I also have a direct link below to the 20" Big Blue Canisters that the Chloramines Monsters use. With this unit most folks just install it first before the entire system.